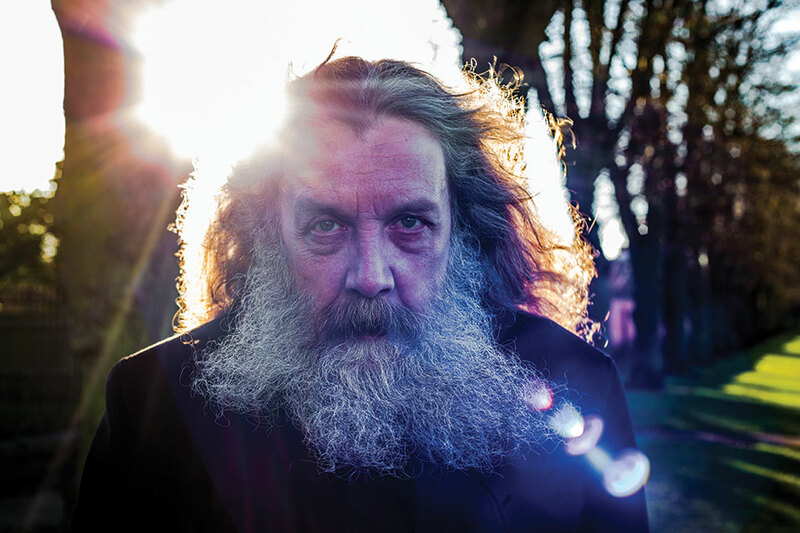 Alan Moore is the most celebrated comics writer living but doesn’t write comics anymore. For the past decade, he’s been working instead on his second novel, Jerusalem, a sprawling epic covering a span of time stretching to the heat death of the universe but contained geographically within half a square mile in Moore’s hometown of Northampton, UK, in an area known as the Boroughs. Using the rapidly eroding map of his own working-class neighborhood as a canvas, Moore spins a tale of life and afterlife, using narrative tools that include stream of consciousness, verse, playwriting, and Joycean glossolalia to boot. 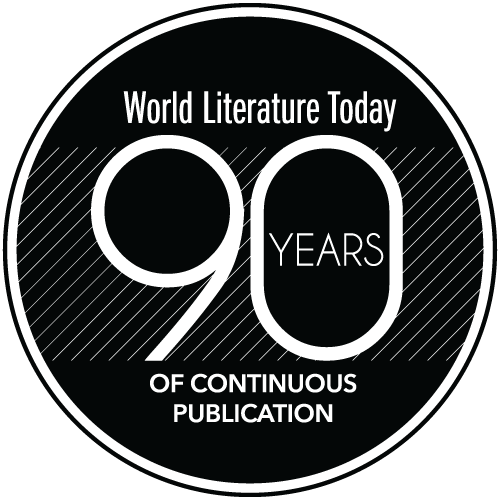 It is both the culmination of his life’s work as a writer and a radical departure for an artist known for them. So it was with great excitement that I sat down to talk with Moore about this crowning achievement of his career. 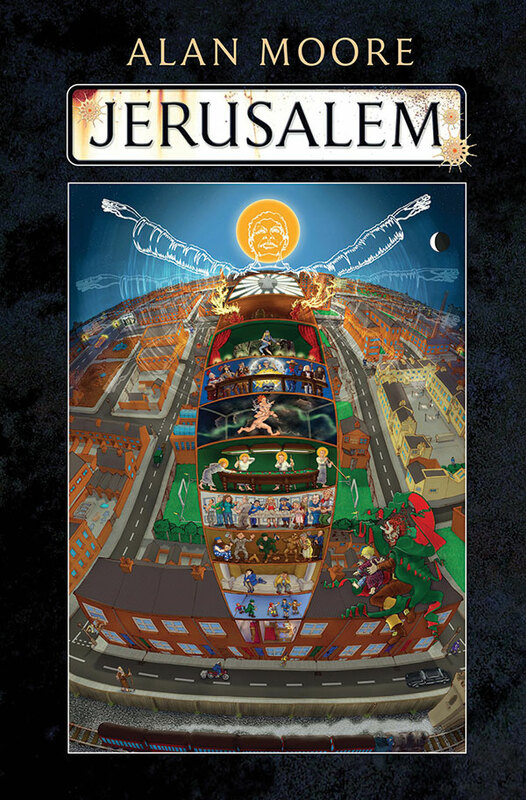 Rob Vollmar: Jerusalem builds on themes and techniques that began in your work as early as From Hell but figured heavily in your first novel, Voice of the Fire, and, more recently, in your homage to your friend and mentor Steve Moore, Unearthing. Could you talk about psychogeography and how it came to play such an important role in your work? Alan Moore: Psychogeography would be the understanding that in our experience of any place, it is the associations, the dreams, the imaginings, the history—it is all the information that is relevant to that place which is what we experience when we talk about a place. That is what we’re talking about. We’re not actually talking about the hard bricks and mortar. Yes, that is all that we can measure in the material world, but that is not the essence of what we feel when we talk about a particular place that means something to us. It is always that psychological effect the place has on us that is going to be paramount, and that is psychogeography—a way of considering the landscape around us as more than its physical components, acknowledging that there is much more to all of this than the material world. The bigger part of our experience is spent in this vague, drifting, entirely immaterial world of associations. I suppose that the first time I ever heard that term, it would have been in the context of my first discovering the extraordinary work of Iain Sinclair. During the early stages of From Hell, I had been sent a copy of Lud Heat, which was one of Iain’s early super-dense poems that are on the verge of turning into prose. He was dealing with his time spent maintaining the lawns and gardens of the churches in East London when he was working for the council. A lot of these were Nicholas Hawksmoor’s churches. Iain started to notice some alignments between these churches, which were suggestive. He put all this into Lud Heat. I was fascinated because this seemed to me to be a new way of engaging with place. Place has always been immensely important in all my work, even from the earliest days of my career. Even if a thing was a fairly average superhero narrative like Captain Britain or something like that that was set in this country, then I wanted it set in a real London that contemporary people would recognize. I was also very keen to have things like V for Vendetta set in a visibly real and accurate London. It wasn’t really until I discovered Iain’s work that I saw the kind of focus Iain was capable of that I had been missing, and I quickly understood that this wasn’t something Iain had invented. There were all sorts of people who had made “walking with an agenda,” as Iain calls it, into a kind of art form. There was Arthur Machen with his illuminating strolls around London. There were the situationists, the surrealists with their walks that would be like planned experiences. There were the flâneurs. There were all these people for whom walking around and looking at things had been a substantial part of their work. It’s a thing that, after Voice of the Fire, I suppose that I was thinking, “Yes, that did a good job of taking these soil samples from different points in Northampton’s history and then analyzing them.” You can tell quite a lot about a place over the centuries in the course of those twelve narratives, but, at the end of the day, you have kind of suggested that the whole of a particular town comes down to the story of those twelve individuals. I think that with Jerusalem I wanted to do something bigger and richer and with a finer texture. I actually wanted to talk not about the famous names of history, although they obviously deserve their place, but I wanted to talk about the obscure names of history, names from family history; from the history of my neighborhood that, to me, seemed every bit as memorable as some of the more famous people I’m referring to. That would have been one of the major impetuses behind Jerusalem. Vollmar: Jerusalem is quite unique in its focus on the common folk and the integral role they play in shaping events that are inevitably retold as the product of great men or powerful forces in action. What were some of the challenges associated with re-creating the lives of people who are otherwise invisible to much of what we think of as history? Moore: There were some challenges but not as many as you’d think. There were some, and I think that all this is related to one of the other reasons why I wanted to do Jerusalem: there is a conspicuous lack of working-class voices in English literature. I’m not going to say that there are none because, hey, there is always Shakespeare who was not, as far as I can tell, a consortium of aristocrats who were all pretending to be Shakespeare for some reason. The serious point is that there aren’t very many working-class voices in fiction, and when the working class are addressed in fiction, then there will generally be one of two modes that will be used: you will either have the working class deplored for their vulgarity, for their poor decision making, for their horrible abject lives, for their stupidity, or, often more sympathetically, you will have the working class pitied for the terrible things that have been done to them and the way in which they have been made to live. Now, actually neither of these options are the way that working-class people think about themselves. We are all heroes in our own narrative. Of course we are. This is why the idea of supervillains in comics is innately so ridiculous. Nobody in the world is ever going to call themselves “Dr. Evil,” because we all are the heroes in our own stories. In trying to address that, there weren’t really that many difficulties. If I were trying to talk about a famous person—like, say, the various references throughout the book to Lady Diana Spencer—there, with that, I did my research. I read the books. I looked at Wikipedia entries. I did as much as I could to actually put together a picture of that woman and her family life. It was a lot easier actually to get the often inexact and fictionalized details of my family’s history and the neighborhood, just from conversations. It all doesn’t have to be upon Wikipedia. A lot of it is these days and that’s a good thing, but there is this other, much older method of transferring information from one generation to another, and that is oral tradition. Even in our techno-rich times, there is still an oral tradition. There are still people with a wealth of stories. Other than the various narratives that were told to me as part of family history, family legend, or tales about the neighborhood, there was one specific book that is probably a cornerstone of Jerusalem. This is a book called In Living Memory, and it was published by Northampton Arts Development in the 1980s. It was a series of interviews, just with the people of the neighborhood, asking what they remembered. It was quite an unusual thing to do, and if my friend Richard Foreman and his accomplices hadn’t done that, there would probably not be a Jerusalem, or at least not in its current form. Some of the most extraordinary things were things that I found in there. For example, I had known what my grandmother’s occupation was, my paternal grandmother. I had known that she was one of those mythical women who lived in the next street that if you’d got a pregnancy that was just about to turn into a delivery or you’d had somebody die, then, in a neighborhood without midwives or undertakers, there would be a woman in the next street or down the road who, for a shilling, would come and deliver the baby or would lay out the corpse. I’d known that my nan had worked in that profession. I hadn’t realized until I’d read the book that such people were called “deathmongers,” which I think you’d agree is a gift to any novelist. That book gave me a lot of very interesting narratives. It gave me the story of Black Charlie, who was somebody that I’d heard about, but I had no further information beyond that. To find out that he was a branded slave. To actually have a reproduction of the brand. To have the bare bones of his story. That he’d started out in Tennessee. That he’d presumably been liberated around the age of thirteen and then turned up in Northampton, seemingly out of the blue, with the possibility of some time spent in Wales before that, and he was already in his forties by this point. So, I fictionalized certain parts of it, but the actual essence of the man’s story and his existence was a thing that I got from this very slender little book that’s just full of marvelous phrases, a lot of which I kind of half-remembered from my parents’ and grandparents’ conversations but which were given a lot more detail in the pages of In Living Memory. Even though these people are obscure, that is only to the greater world. They are still remembered in the places that they used to live, and if that memory was fading to a degree, at least I think it’s relatively secure now in Jerusalem. I’d urge anybody, anywhere. Get out there to some of these places. Talk to the old people. Ask them what they remember. I think that you’ll find that there is a marvelous heritage just waiting a few streets down the road. Vollmar: I had written down the question “Why North-ampton?” and then scribbled it out as the answer seemed obvious. That’s your home. That’s where you’re from. The other part of that is that if I can’t answer the same question about the places that I’m from, the problem isn’t with the places. It’s with me. Moore: It makes life so much richer to actually understand where you are and the often-astonishing tale of how that place came to be. It’s not like this is all some kind of intellectual exercise. I believe that it genuinely grounds you in the world and gives you an expanded vision of that world. It’s the way that we internalize the landscape around us. Yet if they understood the richness under the paving stones that they walk every day, if they understood the astonishing mythologies that were connected to these places, the histories, then they might feel more that they were walking through the eternal, golden city. If they were to internalize that, they might start to feel like the empowered and mythical creatures that inside they want to be. Obviously, I’m writing about Northampton because this is the place from where I am; this is the place that I know. It also turns out to have quite a rich and relevant seam of history running all the way through it. I assume that that would be the same for everywhere. That if you just look deeply enough with the right kind of eyes, I’m sure that you would have found narratives in any place that would be the equivalent of the one in Jerusalem. A lot of Jerusalem is delirious fantasy but, then, there is an awful lot of delirious fantasy in our lives. I think that it needs to be acknowledged because it’s one of the things that drives us. Vollmar: I thought that it was very interesting the way that you constructed your conception of the afterlife. Even though we’re offered this vision of an eternity in which to amuse ourselves, the only thing that matters is what you do while you are alive. As a dead person, your strongest interactions with the living world are in reliving the things you have already done. In every other case, you are just a bystander at best. Moore: Obviously what I’m proposing in Jerusalem is not a religion. It is nothing like one. It is an afterlife scenario of a kind that, to me, has a scientific basis. Einstein believed the same thing. I also wanted to provide a different way of looking at this whole thing that doesn’t defer action until after we’re dead, that doesn’t defer happiness until after we’re dead because I don’t think we can depend upon that. It is a tale of the afterlife with lots of marvelous things happening in the afterlife, a lot of which, I’ll freely admit, is a kind of necessary psychedelic wrapping paper for the central idea. It is not meant to claim that the afterlife is the thing to be focused upon. As you say, it is entirely centered upon the life that we have led, our actions in that life. It puts the center of attention not upon what comes after death but what comes before it, which is probably what we should be focusing upon because it is an area where we have some agency, where we can still accomplish things while we are on the right side of the grave. Einstein suggested that we live in a universe that has at least four spatial dimensions. They have to be spatial dimensions because that’s what a dimension is. In the case of the fourth dimension, there has to be one because Einstein said that space-time was curved, so it needs a dimension to be curved through. The fourth dimension is not time, but, rather, time is the way that we experience our movement through this fourth dimension. We actually exist in what is called a block universe that is an enormous space-time solid in which every moment that has ever existed or will ever exist is there forever. This tends to lead to the idea that our individual lives would be kind of like filaments that were eternally and unchangeably suspended in that huge hypermoment. That would include the fact that we are alive during those seventy or eighty years that we get to spend on this planet. We are alive. We are conscious. That is eternal and that is unchanging. I suspect that when we reach the end of our lifespan, there is nowhere for our consciousness to go except back to the beginning. Our entire lives are an infinite recurrence that are always the exact way every time. There are a lot of implications that come from that. One of them is that we live in an entirely predetermined universe, which I believe is what most modern physicists (although they don’t really like the idea) accept as the nature of the universe that we are in. It is predetermined. This, of course, immediately banishes the idea of free will and causes a variety of philosophical problems. It would probably cause some problems for science because a predetermined universe obviates the laws of cause and effect or, at least, makes them a little more unclear. My own thoughts about this is that there is no good, there is no evil. It is much more like a play in which we have no choice as to our actions and yet that is only when looked at from a higher level, looked at from somewhere with more than four dimensions. It does make things very difficult for religions and, I suppose, for all of us. In a predetermined world, it’s very difficult to maintain ideas of vice or virtue. Yet all of us feel that good people should be admired and that bad people should be blamed. My own thoughts about this is that there is no good, there is no evil. It is much more like a play in which we have no choice as to our actions and yet that is only when looked at from a higher level, looked at from somewhere with more than four dimensions. To us, it will always seem that we have free will. I wanted to see what the world looked like through that lens. If that lens is telling us that everything is eternal, every person is eternal, every place is eternal—then you train that lens upon an area like the Boroughs or like any disadvantaged area. What does it look like then? What do the people look like then? Vollmar: In looking back over your work, The Birth Caul was the earliest thing I could find that was overtly autobiographical. Voice of the Fire features that fourth-wall breaking “I” chapter at its end. Now, in Jerusalem, you have a stand-in in the story except that it’s a woman. I was curious if you could talk a little bit about the decision to cast yourself in a female role and if and how that creative choice altered the way that you wrote yourself. Moore: It probably should be pointed out that I do have some previous form on this. When I was doing Big Numbers, the character in that that I was probably most identifying with or who was a stand-in for myself was also a woman. I don’t really know why I decided to cast myself as a woman. I’ve referred to it as appearing in the novel but only in drag, which is, perhaps, oversimplifying. I want to talk about my family here. I want to talk about my neighborhood. I want to talk about my family history, and I am a part of that history. I can’t just remove myself from the narrative. There has to be someone in the narrative who is kind of like me. However, if that person is Alan Moore, it’s going to bring all sorts of baggage to the narrative that I didn’t want to address. By fictionalizing the character, by making her an artist instead of a writer—she lives at a different address—she is otherwise exactly the same as I am. There are changes of mode between a man’s consciousness and a woman’s consciousness. There are different issues that are going to be weighing upon a male and female mind. The Alma chapter, although it’s a fictional character, that does have some of the flavor of my life without the problem of a huge, surly, hairy, bearded writer that everybody knows about, blundering around in the middle of what is an otherwise rather delicate novel. I thought Alma would acquit herself better in the context of Jerusalem than I would. Vollmar: In preparation for this part of the interview, I was thinking about the Tree of Life, and the path from the Moon into the Sun, which, if I remember correctly, is called Art. Moore: It’s also sometimes called Temperance, but Art is a better name. Moore: Yes, that is the key part. That is the High Priestess. That is path of which Aleister Crowley said, and this seemed cryptic when I first read it, “All of the aspirants to the magic are men. Yet, all of the brotherhood of magic are women.” I didn’t understand that until, through exploring that kind of territory back when I was doing Promethea, I understood exactly what it meant. You’ve probably heard me say that “Magic is exactly equivalent to Art.” This is an example that strengthens that association. As an artist, as a magician, whatever gender you are, you start out as a man because you are the thing that penetrates or is attempting to penetrate the mystery, whether that mystery be Magic or art. At a certain point in your career, you find that you have become female. That you have become the mystery that others are trying to penetrate. Your polarity has changed. That change is what the High Priestess path is talking about. I would love to claim that I was consciously doing that with Alma Warren. I would not rule out that I was unconsciously doing it. I have become more aware that it is not really me trying to penetrate the magic anymore or trying to penetrate the art anymore. I’m pretty much there. This is my life. This is my consciousness. However, there will be people who want to penetrate that life and that consciousness to discover whatever mystery it represents for them. This is the same way that I have tried to penetrate the work of Austin Osman Spare, William Burroughs, or any of the other pointers that I’ve found upon my own path. So, yes, I suppose it is appropriate that I should have become a woman for my part in Jerusalem, though I’m not quite clever enough to have thought of that for myself. In retrospect, I will claim that. Editorial note: For more, read a review of Jerusalem, and this list of Alan Moore’s spoken-word albums. 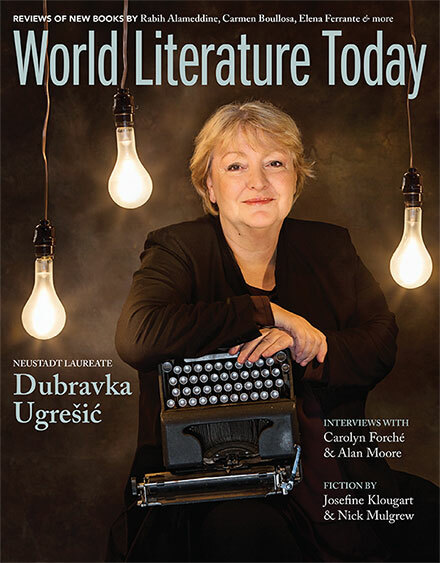 Featuring 2016 Neustadt Prize laureate Dubravka Ugrešić, interviews with Alan Moore and Carolyn Forché, and more!